What made the experience of listening to The Code of the Extraordinary Mind the most enjoyable? This information will Jump Start your Life and Keep you going. I am a 40+ yrs old and single and Need to find new inspiration to keep on going in life. All the old self-help books growing up isn't cutting it. Need a complete revamp in life all areas. This is what I have been waiting for. This information just hit me like Truth does. Once it hits you upside your spiritual self, you start to wake up to the possibilities. Lets see how Far I can go this time. Only Time will tell......See ya on the other side. What was one of the most memorable moments of The Code of the Extraordinary Mind? 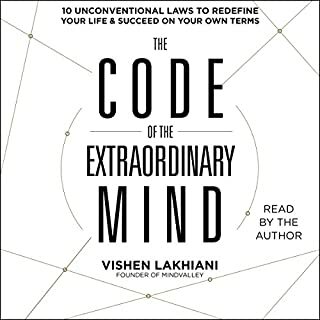 What does Vishen Lakhiani bring to the story that you wouldn’t experience if you just read the book? Signed up for his MindValleyAcademy online and he delivers....walks his talk and gives you the tools and information to succeed in life. Action is the key to Success and all the Habits you develop or customize for your life will require Action, but first you have to experience a Paradigm change in your old thinking to your new thinking. Signup for the MindValleyAcademy course, you will Thank yourself later on.